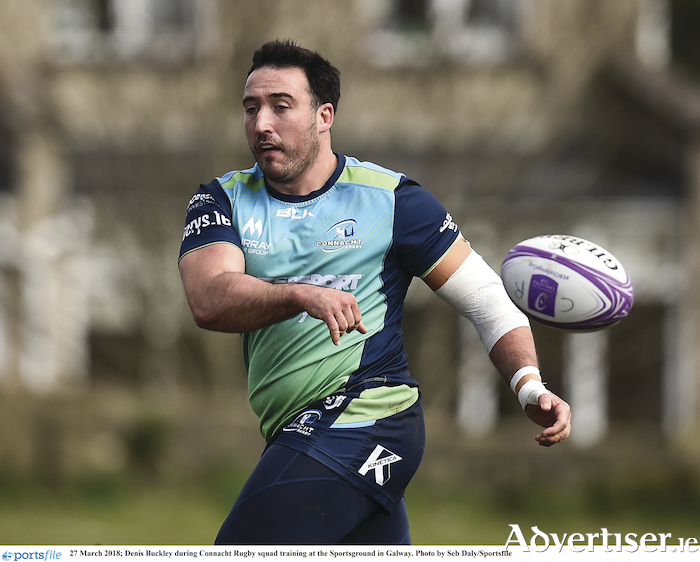 Connacht boost: Denis Buckley has signed on for another two seasons. Fresh from a two-week break, Connacht return to league action in what will be a defining period in this season's campaign. Seven fixtures remain to determine this season's Guinness PRO14 semi-finalists, and if Connacht want to be in that mix, they need to make home advantage count, starting against the visiting Cheetahs on Saturday (5.30pm ). Munster (48 ) and Glasgow (46 ) are leading Conference A, and underneath are four teams all within striking distance of the other. Connacht are currently fourth, level on points with Ospreys in third, but are just two ahead of both Cardiff and the Cheetahs. "Our pool is highly congested," says coach Andy Friend, "so a loss for any of those teams can see you drop from third or fourth to sixth spot, so every game becomes important. The beauty is we get to play all those teams around us, so our destiny is in our own hands." Connacht, not only host the South Africans at the Sportsground, but both Ospreys and Cardiff must travel to Galway, which is a bonus heading into this crunch period. And with a home fixture against Benetton, and an away match to Zebre, Connacht have a real opportunity to make the top three if they harden their efforts. Also a big plus for Connacht this week is the return of Irish international Kieran Marmion, who missed the start of the Six Nations due to an ankle injury. Marmion was back training with Connacht this week after recovering from surgery, and he is set to play for Connacht alongside returning Ireland squad members Ultan Dillane, Caolan Blade, Jack Carty and Tom Farrell, while Bundee Aki and Quinn Roux remain unavailable. It is a real boost as Connacht head into this block of key games. "They are all important games now. We have 13 games of football left, if we are playing every games in every competition. So there are not a lot of games of football, but you have to win them to stay involved." The two week break came at a good time for Connacht, particularly after another disappointing effort in Cardiff. "It was really important - a lot of energy went into the last block, a lot of time away from home, so it was good to decompress, take a break, and get back to normality because you come back hungrier. "We came off the field this week after one of the most intensive sessions and all the blokes are dialled in. We have to keep pushing each other during this period. We had 15 PBs (personal bests in speed ) since Christmas which is great, so it's about keeping the body and mind fresh." The visiting Cheetahs are an exciting team to watch - love to play with ball in hand which has produced some 54 tries (Connacht have 34 ), but they have similarly leaked a significant number, 55 (Connacht 33 ). And while weather at the Sportsground may play its part, Connacht will need to be on form. "Cheetahs are the form team. They may have started slow, but they really have their game going well and they will be a handful for us. We had a good win in Bloemfontein, but they will be smarting. "In the last block we had seven wins away from home, but being at home is good for us and gives us confidence. We all get energy from the Connacht crowd, so it is a slight advantage for us, and if the weather does what it does sometimes, we are probably more used to it, but it is never a given. "We are going to have to be on our game defensively," says Friend. "If you give them space, they will hurt you, but if you can get up in their faces and shut them down, like we did over there, we can nullify that, so it is a key focus, as well as us trying to put them under pressure." Having introduced several Academy players and rotated throughout in the previous block of games, Friend is now looking at selecting his top 23/25 players on a more consistent basis. "I have told the players that we have done a lot of rotation and we are getting to the stage of the season where it is coming down to form and our top 23 or 25 players." Still out injured until mid March are lock Gavin Thornbury with a shoulder injury, which did not require surgery, and Niyi Adeolokun (bicep ) who is "close" to a return to training. Openside Sean O'Brien (shoulder ) and Conor Mckeon (shoulder ) are currently training, while Robin Copeland (hip ), Peter Robb (knee ) and Peter Claffey are fit. More good news for Connacht is a two-year contract extension for Denis Buckley, who had been rumoured to be on both Bristol and Ulster's radar. "Really pleased" says Friend. "He is a Connacht man, with 150 caps plus, and a rock in that scrum. You know when Denis is there in the scrum, you have stability. He does that, but around the field he is one of the most energetic props in the competition." Friend says although the bulk of next season's recruitment and retention is complete, there will be a few more signings to announce, including replacements for Worcester-bound prop Conor Carey, and Cian Kelleher.